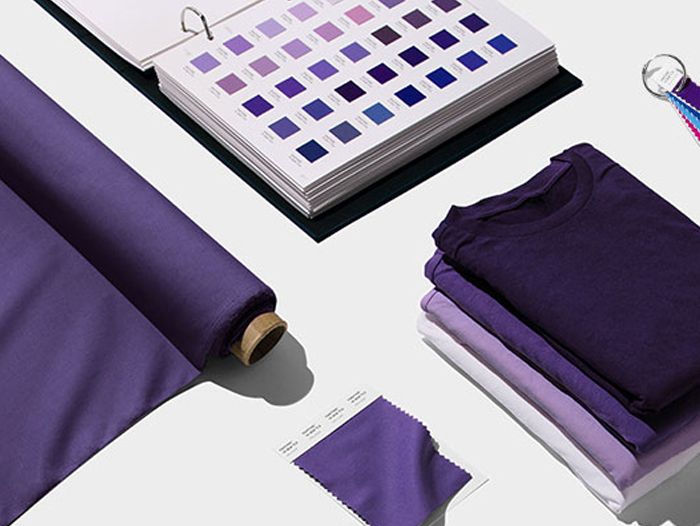 From a designer’s perspective, Ultra Violet is a great color to work with. It has limitless possibilities, makes a bold statement, and goes well with so many other colors. When the color of the year is first announced it is usually right off the fashion runways of New York and Paris, but then we start to see it creep into interior design and eventually wedding color palettes too. We’re lucky in that Ultra Violet is actually quite an easy color to work with. It’s rich and vibrant shade goes so well with many other color combinations. It’s easy to add as an accent color, whether you pair it with neutrals or add it to the classic combination of black and white. 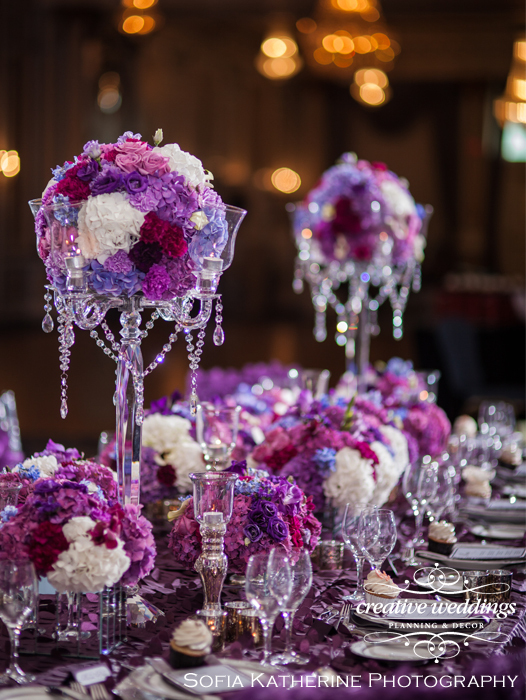 Ultra Violet itself has a ton of ways that it can be included as part of your wedding décor. Purple colors of any shade usually look good on a variety of people making it an excellent choice for bridesmaids gowns. You can dress all of your ladies in this rich color, or mix it up and include it as one out of a combination of purple hues (just make sure the dress colors are all from the same color palette so they don’t clash). It works for all four seasons, but the darker shade may be particularly effective for fall or winter weddings. It can be used for invitations, menu cards, table numbers and more! 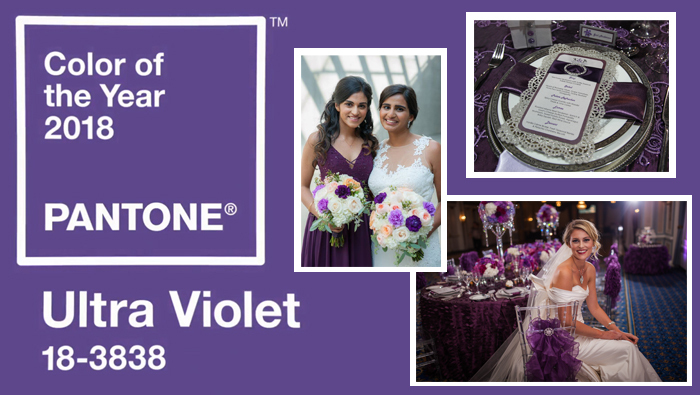 Incorporating ultra violet as one of the colors in your wedding stationery is a fantastic and easy way to include it as part of your color palette. It provides an excellent contrast when used against silvers and greys, or even softer shades of lilac or lavender. Its vibrant shade will add a definite pop of color that will attract the eye. There are a number of assorted natural flower blooms that are accessible in deeper shades of purple. 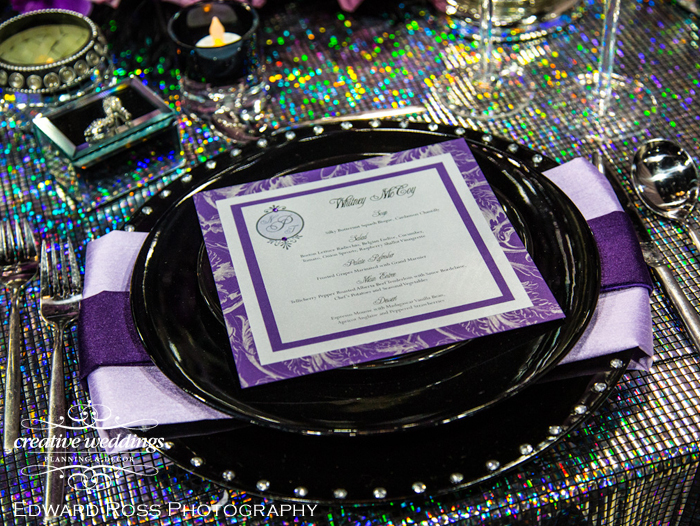 This may actually be one of the easiest ways to include Ultra Violet in your wedding design palette. Some of the blooms you can choose from include stock, lisianthus, iris, orchids, hydrangea, carnations and more. Pair it with softer shades of purple to offer more depth and texture to your bouquet and centerpieces. Your floral designer should be able to help guide you through this process and be able to offer even more possibilities. 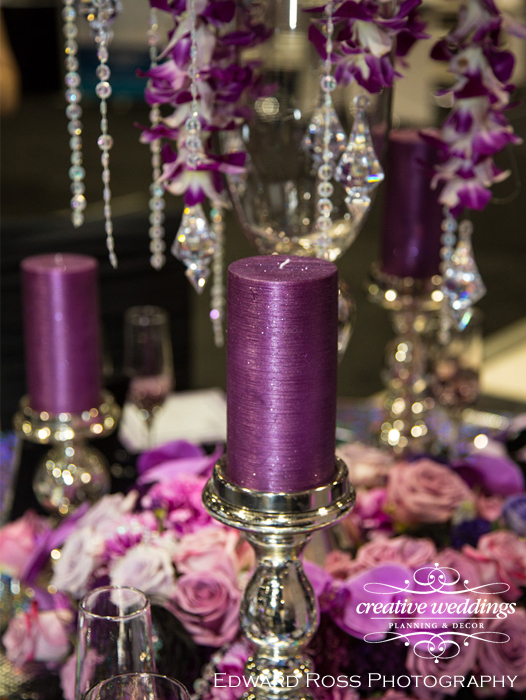 The final way you can include Ultra Violet in your wedding palette is to look at detail and accent pieces. 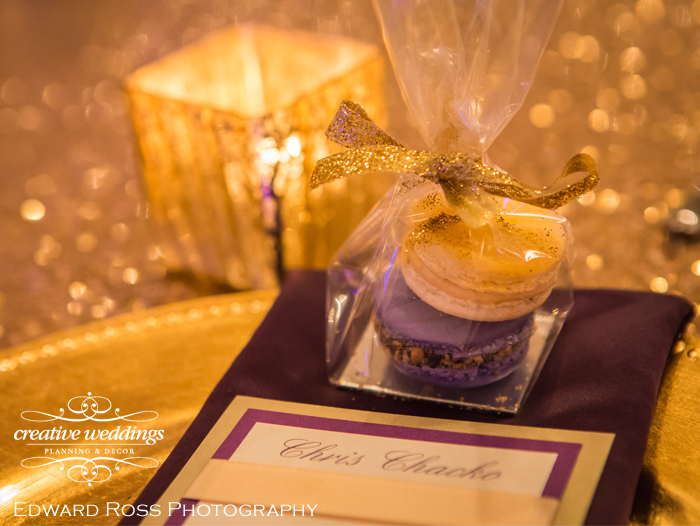 Candles, favors, chair detailing, signage, backdrops, and possibly even dessert food ideas like macarons. The possibilities are literally endless and can go where your creative mind will take you. 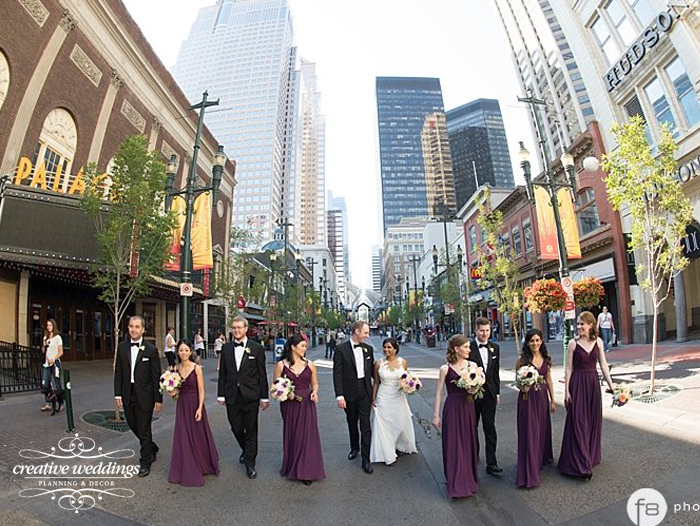 Cathy MacRae is a Calgary, Banff, Canmore and Lake Louise wedding planner in the business of designing customized weddings that make your heart skip a beat! She is the lead wedding planner and design coordinator for Creative Weddings Planning & Decor©, working with couples to plan chic and stylish weddings that make your heart skip a beat! Located in Calgary, Canada, she plans wedding for couples primarily in and around the Calgary, Banff, Canmore, Lake Louise, and Fernie area. Her clients want a wedding that is all about romance, elegance and personalized style with meaningful and heartfelt moments that take your breath away and created an incredible guest experience. She has been in involved in the wedding industry for over nine years now. The foundation of her business has been built on developing relationships with numerous quality vendors that her allow her to best match them with her clients so the end result is a unique wedding celebration that tells a story and sets the stage for the couple’s “happily ever after.” As a destination wedding specialist, she also works with couples who desire to wed in various picturesque dream locations throughout the world. She had done weddings in various exotic locales such as Hawaii, Mexico, Costa Rica, and throughout the Caribbean. She is available to plan weddings internationally.